The middle portion of the South Fork American is a perfect float trip for families with young children aged 5-7 years old. This meandering section features gentle Class II rapids and calm, relaxing pools. 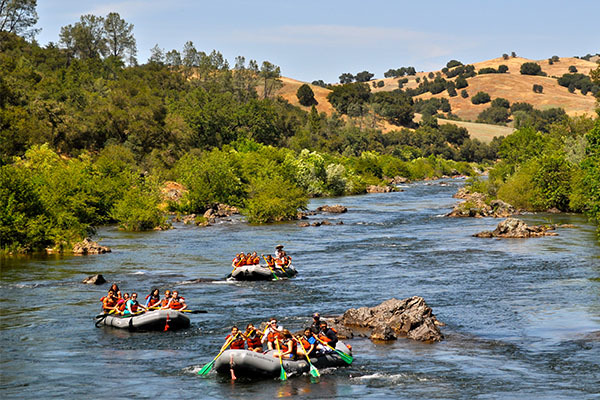 Lounge on the boats or swim in peaceful areas as you wind through the gold country of the Sierra Nevada foothills. Every day on the Easy Section of the South Fork American is a relaxing day. You'll float through calm pools, marvel at the beauty of the canyon, and every so often get your heart pumping a little faster when the current picks up with Class II rapids. If you feel up to it, you might venture out of the raft and swim in the river or just float in your life jacket as the river carries you around the corner and towards the next riffle. 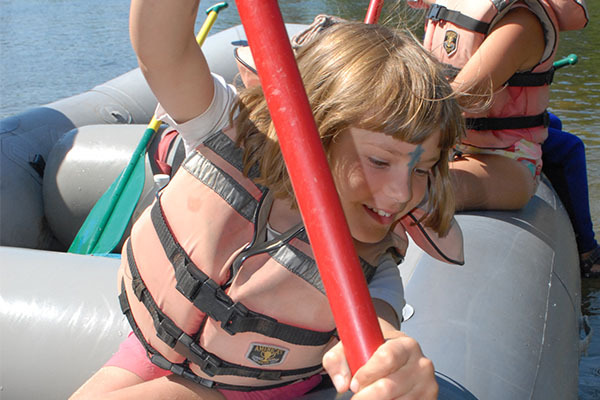 On 1-Day Tom Sawyer trips we spend a lot time exploring and experiencing the river as a kid yearns to do. Like Tom, we’ll take extra time to enjoy our surroundings. When in season, we'll pick blackberries hanging off the banks, watch a momma duck with her ducklings, swim in small rapids, and float along with a mask and snorkel looking for fish below. It all makes for an adventurous and satisfying day for kids and adults. Lunch along the river is a treat and those who want more excitement and adventure in a smaller water craft can enjoy kayaking instruction. *The itinerary above may be altered due to a range of variables, including river flow levels, water release schedules, time of year, and other factors. Contact us if you have any questions. Tom Sawyer Float Trips do exactly that...they float an easy 5 mile section of the South Fork American River through the Coloma Valley. 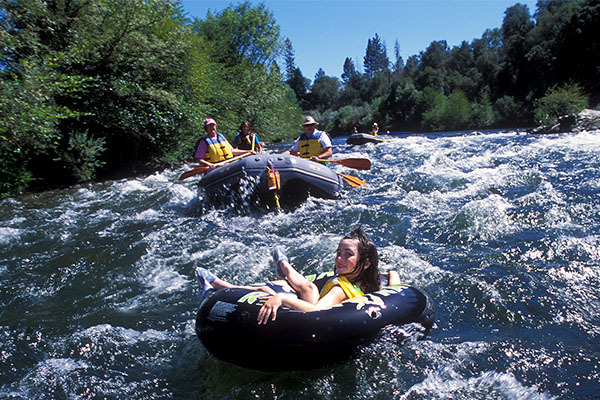 This section of the South Fork American River is the perfect float trip for families with small children. The river is gentle and forgiving, with just enough excitement to delight a young child and hold an adult's interest. Most of the time, the whitewater is more "riffle" than "rapid," allowing lots of time for reverie. As the South Fork traverses the Coloma Valley, it passes between high rolling hills and gentle meadows that were homesteaded in the early 1800s. The river meanders slowly by oak tree groves; alder and cottonwood trees grow right out of the riverbed. In late summer, wild blackberry bushes dot the riverside, offering a delicious time-out for paddlers. The valley is not densely populated, but remains home to local people who reside in this quiet community. As we float down the river, homes are usually buffered from our view by thick river foliage. Because the South Fork is so close to many metropolitan areas, it's easy to go on a rafting trip yet still arrive back home with plenty of time to relax. You'll begin rafting and kayaking late afternoon, have lunch, then raft and kayak some more before ending in mid-afternoon. The South Fork American is a dam-controlled river. Because the river's flows are regulated, its levels are dependable and extremely consistent. Tom Sawyer Float Trips are offered during warm weather months, typically June through October. In high water years the beginning of the season may be delayed until the river flows drop to normal levels. 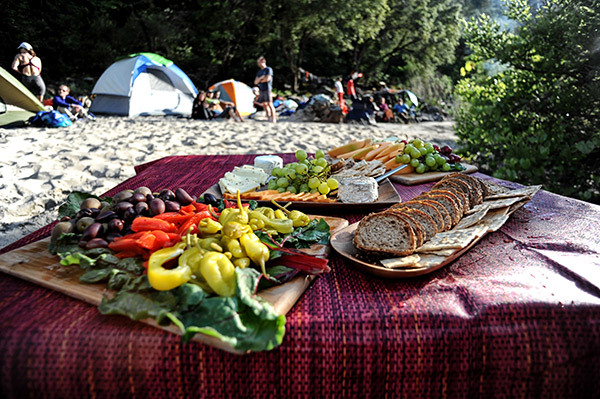 On Tom Sawyer trips we stop at the All-Outdoors River Center to enjoy a family-style picnic lunch. A healthy variety of sandwiches, fruit, chips, drinks, and desserts will energize trip members for more miles of fun and exploration! All-Outdoors uses oar-paddle assist rafts on this trip. With this type of raft you can sit and enjoy yourself while the guide does all the work with their oars, or you can choose to assist them with your paddle. During the trip you can also have the option of paddling in one- or two-person inflatable kayaks. Guides will provide kayak instruction and close supervision while you guide your kayak downstream. All guests who would like to kayak should be able to swim. "Great family river rafting trip. Did this trip with a bunch of family and we were all able to take our kids. 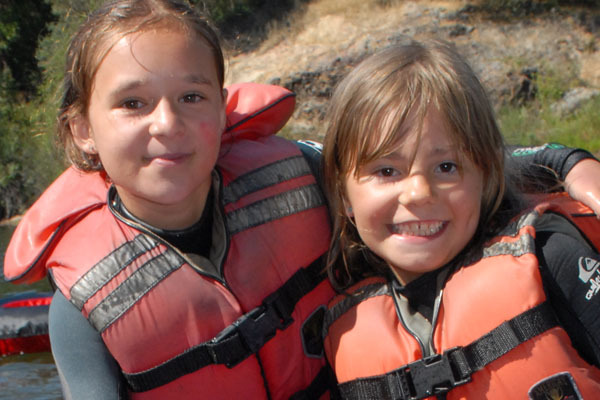 Great river rafting experience for the little kids. We had 5 year-olds all the way up to 12-year-old. Trip had a lot of coasting and right amount of class II Rapids to make it fun for adults and kids."